Memoirs are an interesting breed of book. On the one hand, they are incredibly self-indulgent: anyone who thinks that their life is one that people are going to want to read about have to be at least a little bit arrogant. On the other hand, there are lives that are fascinating, and the writing is good enough to help even the most disconnected reader connect to the story the author is trying to tell. 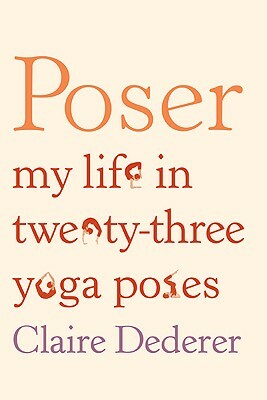 In Poser, Dederer walks a fine line between those two memoir extremes. Sometimes, she is overly arrogant about her experiences and her plight; her insular liberal white enclave in North Seattle (and eventually Boulder, Colorado) has warped her perception of child raising (she feels guilted into attachment parenting; and feels guilty again when she doesn’t like everything that espouses), marriage (as a child of divorce, of a sort, she feels like everything needs to be perfect), and sacrifice (shopping at Trader Joe’s instead of Whole Foods) and makes the book unrelatable to anyone who doesn’t live or aspire to that life. There was a moment, about halfway through, where I got fed up with Dederer’s self-pity and judgment of others and seriously considered abandoning the book. One can only handle so much whining from an author, after all. I thought I would do yoga all my life, and I thought that I would continue to improve at it, that I would penetrate its deepest mysteries and finally be able to perform a transition from scorpion directly into chaturanga. But here’s the truth: The longer I do yoga, the worse I get at it. I can’t tell you what a relief it is. So, for that reason alone, I found the book to be worth the time. Dederer’s life was fascinating, if a bit warped, and her writing excellent. But that wasn’t enough to carry the book. Thankfully, she had the yoga bits to pull the rest of it along.